Four Winds Canvas Works, located on the Historic Pier 39th in Astoria, Oregon offers custom canvas work to fit any and all your needs for interior or exterior projects. Sail covers, awnings, cushions, and custom bags, are just a few examples of what we can do for you. All projects are made using the highest quality materials from the fabric down to the thread to ensure a long lasting product that can hold up to our Northwest weather. 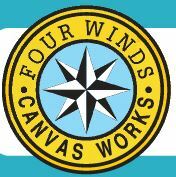 Everything at Four Winds Canvas is done custom, made to order, by two Astoria locals, Susan and Kurt. We talk with you directly about what your looking for with your next project, measure it to ensure a perfect fit, discuss material options, and then get to work. Due to the high demand for canvas solutions in the Northwest, plan on 4-6 weeks for your project depending on the size. Need a patch job? If you have an item that just needs a patch job or new zipper, bring it into the shop and we can help. We also offer a large variety of durable bags at our shop that vary in size and color from an over the shoulder IPAD bag to a large wood carrier and everything in between. Our bag inventory is always rotating with different colors and sizes so come visit us to see what we currently have.